Semiannual dividend will rise to $0.46 per share. Hoping the situation will be anything but temporary, staffing specialist ManpowerGroup (NYSE:MAN) announced Tuesday it will pay a new, higher semiannual dividend of $0.46 per share on June 14 to shareholders of record at the close of business on June 3. ManpowerGroup has paid a semiannual dividend consistently since 1994, with the just-declared payout representing a 7% increase, or $0.03 per share, from its prior distribution of $0.43. ManpowerGroup places more than 630,000 individuals with 400,000 clients across 80 countries and territories. The most recent dividend payment equates to a $0.92-per-share annual dividend yielding 1.7% based on the closing price of ManpowerGroup's stock on April 30. MAN Dividend data by YCharts. 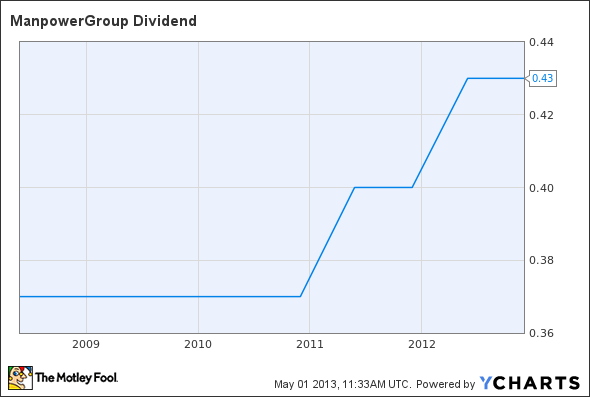 Chart does not reflect new higher dividend payment.